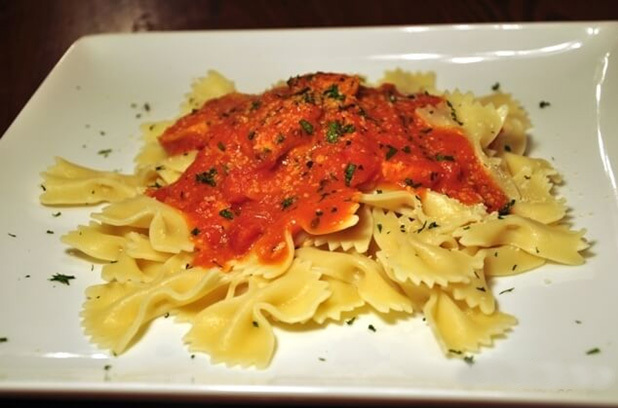 A colorful Main Dish with Ethnic Cottage Jersey Fresh Tomato Basil Sauce. 1 Table Spoon of butter, 1 Jar of Ethnic Cottage Jersey Fresh Tomato Basil Tomato Sauce, pinch of ground black pepper & table salt. In a large skillet or saucepan, melt 1 Table Spoon of butter over medium-low heat. Add 1 jar of Ethnic Cottage Jersey Fresh Tomato Basil Tomato Sauce and stir well. Add a pinch of ground black pepper (optional) and table salt (optional). Simmer over low heat for 3-5 minutes (until well heated). Serve over cooked Bow Tie Pasta. Note: Steps 1-4 are quite optional. I usually just boil pasta (as per packet directions) and pour over the sauce straight from bottle. Mix everything well and microwave for 2-3 minutes or until the food is well heated.